In recent decades, certain aspects of architecture have become increasingly open to scientific analysis, most notably when it comes to a building’s environmental impact. 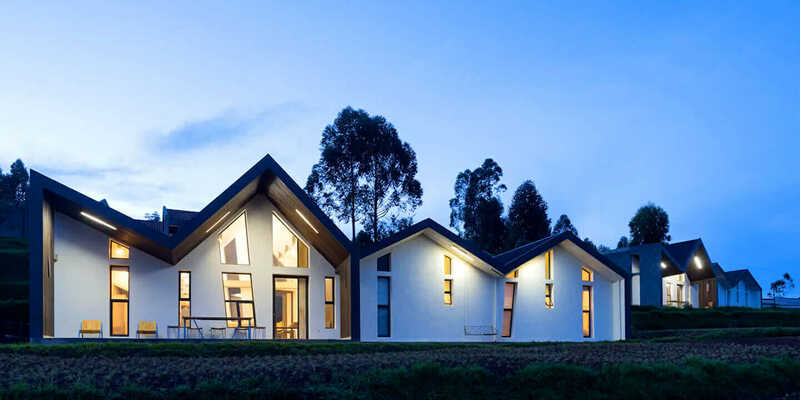 It’s no surprise, therefore, to see MASS Design Group’s claims that its work uses 74 percent less embodied carbon than typical building projects or that 78 percent of its materials are sourced within 100 kilometers, but alongside these were some more unusual metrics: Since it was founded, the firm has invested 88 percent of construction costs regionally; created 15,765 jobs; and in 2016 alone, its work served 64,580 users. Those numbers suggest a way of thinking about architecture that few have attempted before—a way that, if widely adopted, could fundamentally change the way architecture is practiced and evaluated. We spoke to MASS co-founder Alan Ricks to find out how these statistics are calculated and what purpose they serve. In order to calculate the numbers, MASS Design Group has had to intelligently combine datasets to arrive at useful statistics. For example, to calculate user numbers, MASS considers “primary users,” for which there is usually solid tracked data, and “secondary users,” which may not be tracked but can be estimated based on the primary user numbers. In a hospital, the number of primary users (the patients) is known, and the number of secondary users can be extrapolated by multiplying this by the average number of visitors and family members per patient. In a school, the calculation is similar, with students as the primary users and family and community members as the secondary users. While Ricks states that the number of users is “a loose proxy” for a building’s impact, he adds that MASS Design Group is beginning to invest in “more rigorous assessments of value.” In Malawi, where MASS built a “village” of maternal waiting homes, the firm conducted surveys about the effects of the architecture among the women using the facility and compared their answers to a similar survey conducted in a government-built facility. Finally, Ricks talks about measuring the indirect impacts of architecture, which he discusses within four key categories: economic, environmental, educational, and emotional. At this stage, the economic measurements being conducted by MASS center around measuring the principles espoused in its #LoFab campaign—that is to say, how much of the building’s construction budget is being spent locally and how many hours of employment it has created within the community. The environmental impact can be measured through both carbon emissions and—importantly—embodied carbon in the building’s materials, metrics that many in the industry are now familiar with. Ricks adds, though, that “most of the places we work don’t have manufacturer specifications that give you all that information, so we need better ways of creating the carbon coefficients for the way most buildings are built.” Educational outcomes are measured by recording the number of workers who take part in “capacity building” workshops to learn new skills. Finally, emotional value can be summarized as the collection of testimonials on display in MASS Design Group’s videos, such as their Beyond the Building series. That final aspect may be more difficult to measure scientifically, but it is nonetheless a key component of the firm’s process. 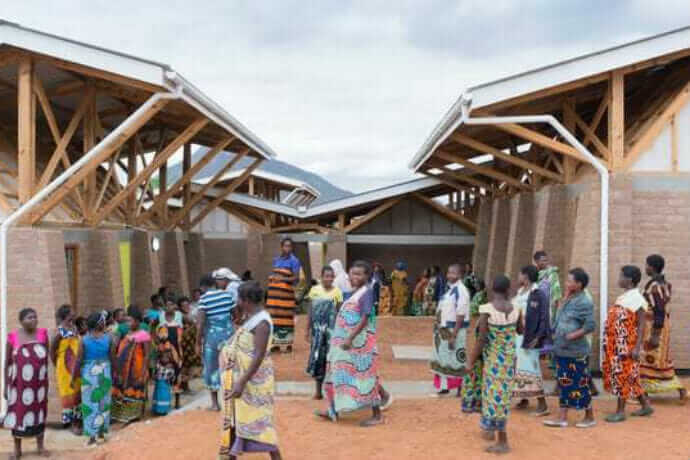 MASS Design Group’s Maternity Waiting Village in Malawi. 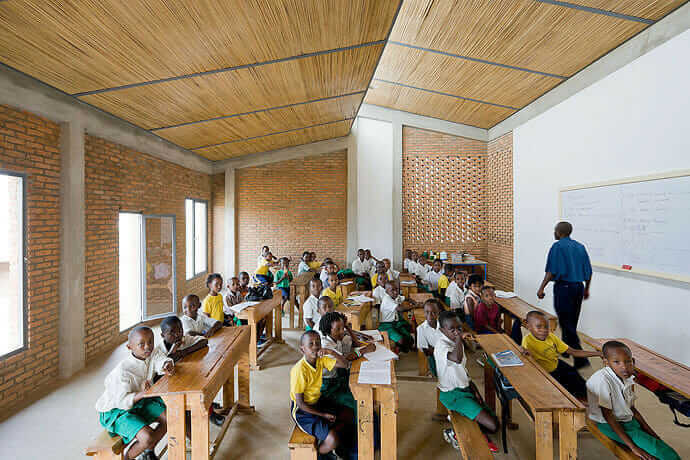 MASS Design Group’s Umubano Primary School in Kigali, Rwanda. Students attend class at MASS Design Group’s Umubano Primary School in Kigali, Rwanda. Image by Iwan Baan. All these methods for tracking a building’s impact go far beyond the methods architects usually use to evaluate their own work—even in the rare cases when a post-occupancy evaluation is carried out. But Ricks is clear that MASS is just beginning to understand how they can measure the many dimensions that support their philosophy of building. “There’s more work to be done there to look at issues such as purchasing power, equitable employment of women and stuff like that,” he says. Through their Foundation, Bill and Melinda Gates have been at the forefront of 21st-century “venture philanthropy,” a system in which the dispassionate methods of business are applied to humanitarian causes to increase efficiency and improve outcomes. It makes sense that an architecture firm exposed to this system would emulate it. However, hidden within this admission is the key to understanding the true strength of MASS Design Group’s data-driven approach. For the Gates Foundation, applying metrics to its funding programs isn’t simply a way to explain to the world the good it’s doing or even to show ways that certain programs can be executed better. The metrics it uses can help it to do both those things, but primarily they are about finding out which of the programs deserve to exist at all. Famously, when the Gateses began their charitable work in the late 1990s, they were initially skeptical about the Malthusian implications of saving children’s lives only to end up with more mouths to feed. But when they were shown the evidence that reducing child-mortality rates consistently reduces the number of children women have, the Gates Foundation made a rapid course correction, changing the focus from contraceptives to the vaccination programs that are now the lynchpin of the organization. 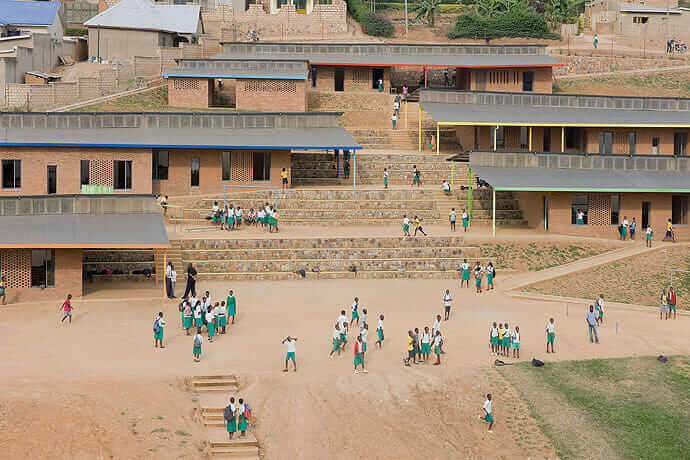 In their annual letter about their foundation’s progress, Bill and Melinda Gates do not mention architecture at all—despite the fact that they specifically highlight Rwanda, a country that has been investing in well-designed health buildings and a country that, with the Butaro Hospital, provided MASS Design Group with its breakthrough project. For Ricks, that’s a problem: “I think we have to prove to people like Gates that design matters,” he says. “We had to give them clear design interventions that could correlate to improve the outcomes that they were concerned about and, at the same time, that we could design a project that could be built affordably and that could have greater impact within that community by investing in more equitable building processes. That’s the kind of triple-bottom-line scenario that is compelling.” It’s also the kind of triple-bottom-line scenario that is required to succeed in today’s world of Big Data and impact-driven decision making. 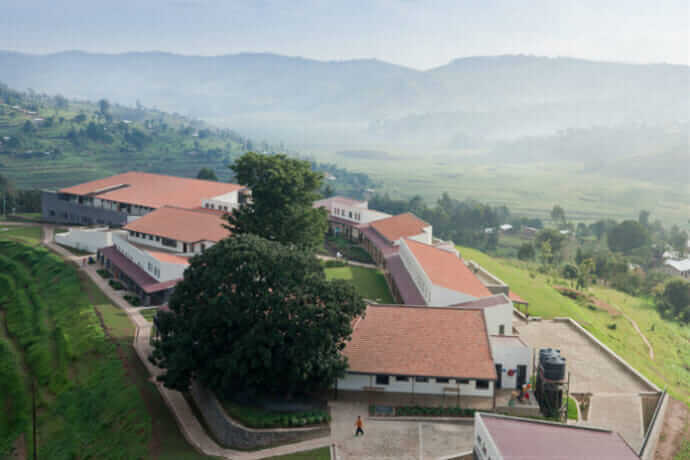 An aerial view of MASS Design Group’s Butaro Hospital in Rwanda. 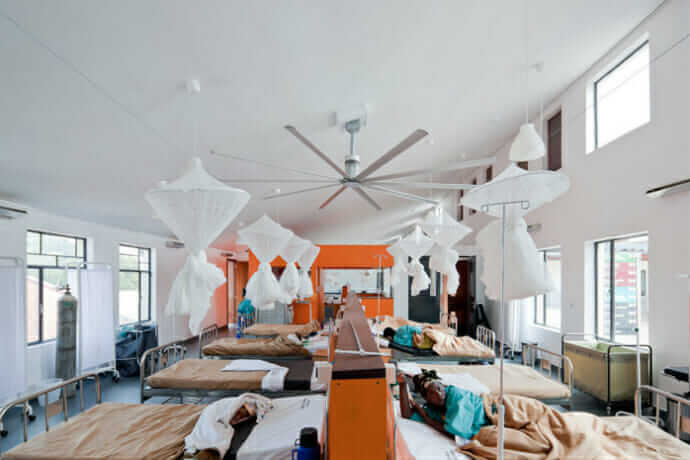 Patients convalesce in MASS Design Group’s Butaro Hospital in Rwanda. 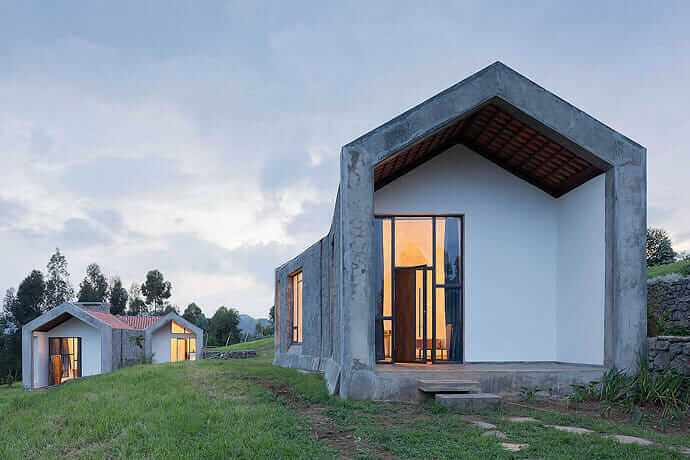 Housing for physicians at MASS Design Group’s Butaro Hospital in Rwanda. “This is not exclusive to emerging markets; this is something that’s as relevant in Boston as it is in Kigali,” he adds. While MASS Design Group’s data-driven approach may have its origins in the world of charity, it’s about much more than simple do-goodery. Showing that you can serve others in order to serve yourself (or in some architectural markets, perhaps even to save yourself) is something that all architects should be invested in. Article by Rory Stott. This article originally appeared on ArchDaily.com.